As you know, I’m a big grid system user. 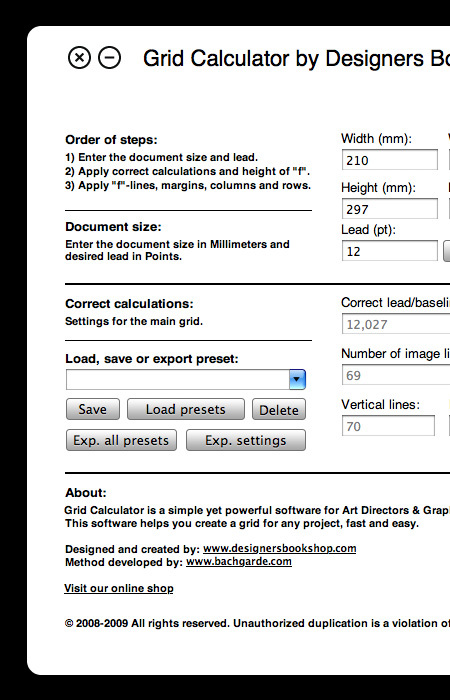 One of the most time consuming, and sometimes frustrating, aspects of grid systems is calculating and creating them. If you’re new to grids, I suggest you do it all by hand at first to learn the process. But once you get the hang of it, and understand it, an application can speed the process up considerably and save you valuable time. Over the last few months I’ve been using an app called Grid Calculator, developed by Designers Bookshop, to do all my calculating for me so that I could concentrate on other things. It’s available for both Mac and PC and helps with calculating correct leading, margins, gutters, row space and “f” height for image placement. It also includes a handy conversion tool and document proportions. It’s currently aimed more towards editorial design, but it could still be used for web design with some minor calculating on the side. Hopefully they expand the next version to include more features for web specific design. I figured that a lot of you would be interested in this app, so I’ve contacted the company and they’ve agreed to give AisleOne readers a 10% discount. The offer is only valid this week: Monday, April 27th to Friday, May 1st. To get the discount, enter in the following code upon checkout : Baseline. 4 Comments on "Grid Calculator by Designers Bookshop"
Looks good, but I’ll rather wait for the free spreadsheet alternative that I know is arriving at a particular blog (not mine) very soon! Antonio where is a good resource for learning how to calculate grids ‘by hand’. I concur with J, would love a simple explanation of the maths. I can’t get my head around using ratios to layer divisions onto the page. E.g. 1:1.414 for A4. Please help.